It was a cold January day when I returned to NYC from an even colder Minsk, Belarus. After being apart for three weeks, Jasper was anxiously waiting for me at the corner of Central Park. It was already dark when we walked into Central Park to go to the ice skating rink. Unfortunately, we didn’t quite make it there but on a little bridge with views of the skaters and with the Waldorf Astoria in the background, Jasper asked a few strangers to take a romantic picture. At the moment they were about to take the photo, he dropped on one knee and proposed with an astonishing ring. A little lost for words and with a gigantic smile, I accepted his proposal to marry him. When we started planning the wedding, we knew we wanted to combine a stylish red-carpet style New York event with a traditional church wedding. Thus it was decided to arrange two weddings! The first part was scheduled to take place in New York, since all our friends were coming from many different places, Australia, London, Amsterdam, and Miami to mention a few. New York was the perfect place for everyone to meet and celebrate our wedding. 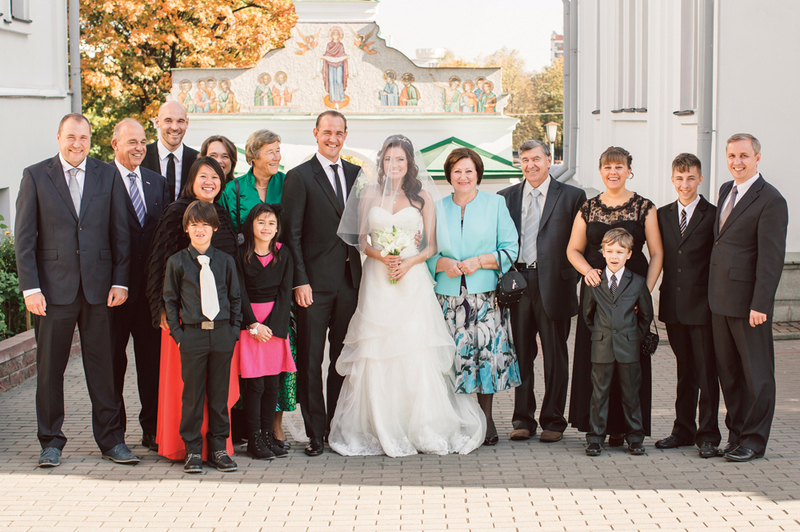 My parents excitedly took on the responsibility to arrange a gorgeous three-day wedding in Minsk, where we spent a magnificent time surrounded by both our families. 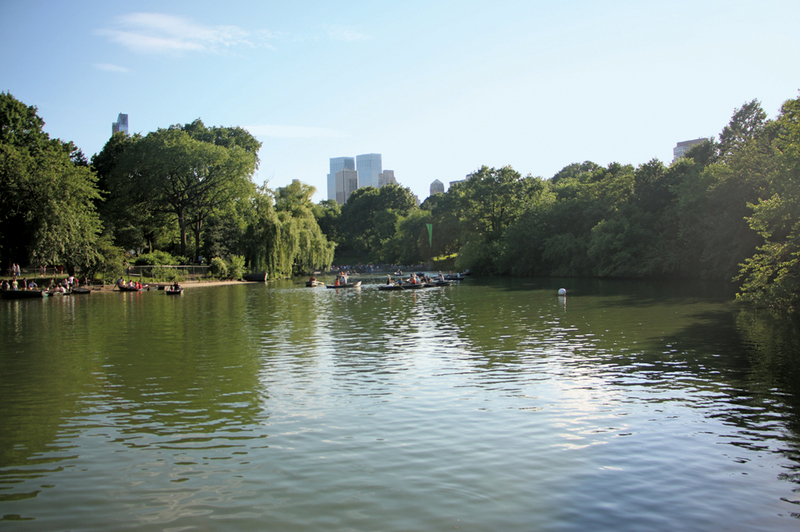 We live on the Upper West Side and Central Park has always been a significant part of our lives. Therefore The Boathouse was an obvious romantic choice for our NYC reception, and it also offers delicious superb food. 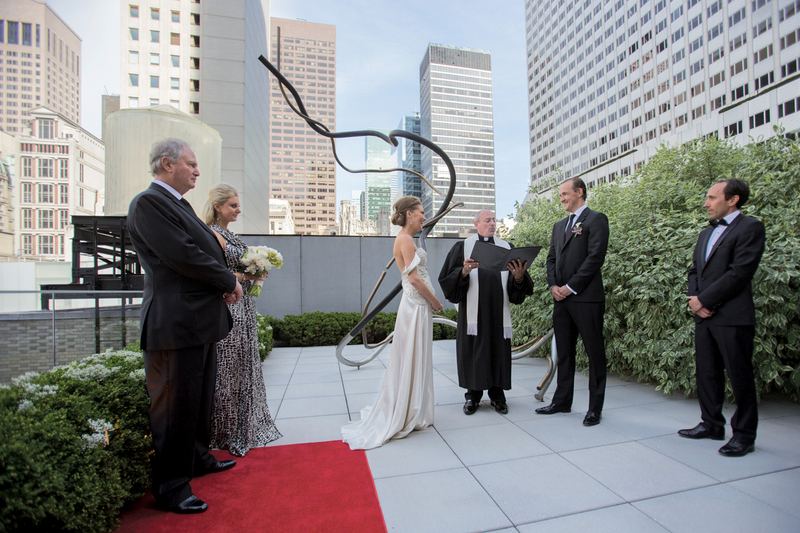 Our NYC ceremony was on the MoMA Museum Tower roof terrace, chosen for us thanks to a generous gift by our dear friend Richard Kandel. Both our venues were extremely accommodating and helpful in making sure that we got what we wanted. The staff at the MoMA Museum Tower made it an exquisite experience for our guests and us, welcoming and leading guests with white glove treatment. The Boathouse was very helpful and let us stay well beyond the allocated time of our dinner. They made sure we had an amazing experience there, and our expectations were surpassed by the food they served. Deborah, the owner of Dish Food & Events, prepared a beautiful assortment of hors d’oeuvres. Each and every one of them was a delight and looked stunning. Guests ch ose their dinner off a menu. Appetizer choices included Berkshire prosciutto, jumbo lump crab cakes, heirloom tomato salad, and chilled yellow fin tuna tartar. For the entrée, our guests chose from grilled Block Island swordfish, roasted pork tenderloin, grilled filet mignon, or roasted king oyster mushroom. Dessert was a choice of a sour cream cheese cake with lemon blueberry compote, a warm truffle cake with chocolate sorbet, or crepes with blueberries and lemon curd. We would love to express our gratitude to our dear friend and spectacular photographer, Oswaldo Saiki, our splendid designer Salvatore Sicuro, as well as all our vendors. A special thank you goes to our parents, families, Richard Kandel, and all our friends who made our double-wedding the most spectacular experience in our lives!